Afela is a modern, flexible and responsive Joomla! theme. Built with the latest technologies. Versatile and responsive grid makes your website looks perfect in all mobile devices. Afela include 8 Home Versions (Business, Agency, Onepage, shop, Magazine and Photography); custom pages like Services, About Us and more. Afela is E-commerce ready and has all important shop pages. 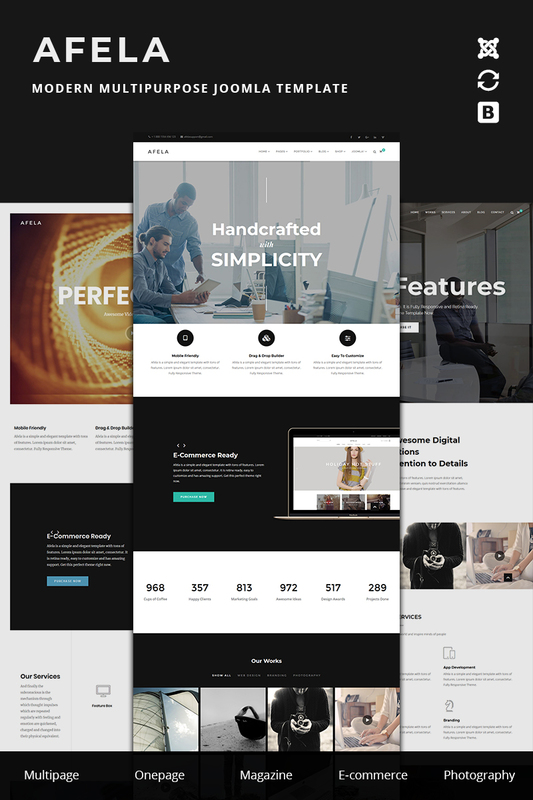 Suits great for business companies, digital agencies, startups, photographers, online stores, webmasters, freelancers, personal portfolio and for landing pages as well. Start you journey with Afela today and you'll never forget it!